Educational robot line follower Pololu 3pi. Great platform to start your adventure with robotics and programming. The heart of the robot is a popular microcontroller AVR Atmega328. Robot Pololu 3pi learning platform, whose main objective is to follow the black line on a white background (line follower). Exemplary features of 3pi can be seen in the video in the further part of the description. The drive of the robot are, used in the fastest robots in Europe, two micro-motors, Pololu 30:1. 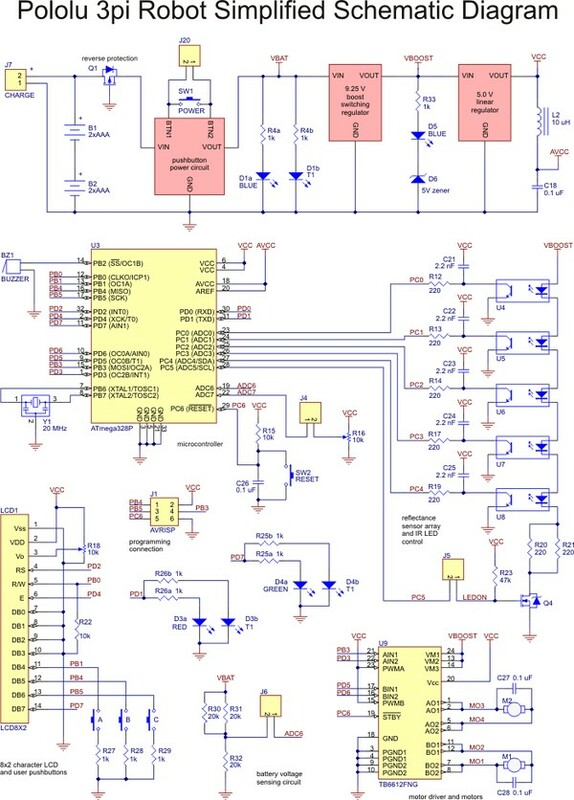 The heart of the design is a popular AVR microcontroller Atmega328 used in Arduino modules. To distinguish colors of the floor, there are reflective sensors connected to the analog outputs of the controlling microcontroller. The user interface represent a button with alphanumeric LCD display. The robot is powered by four AAA batteries. Video with exemplary functins of 3pi robot. The 3pi robot is a perfect solution for people who want to learn programming and at the same time to relax while developing the electronic circuits, as well as the selection and installation of the mechanical parts. The design will explore opportunities offered by the microcontrollers of the Atmega series, to learn all the intricacies of programming in C or BASCOM AVR. To download the software, you can use one of the existing AVR programmer. The Pololu 3pi robot uses Kanda ISP connector 6pin, most popular programmers have 10 pin ISP connector. In our offer you can find an adapter to connect the system with a standard connector 10-pin plug. Black mounts for motors Pololu micro in black. The price for the two pieces. Miniature high-power engine company Pololu gear 50:1, is 630 rpm, the torque is 1.1 kg*cm (0,107 Nm). Has an elongated shaft, allowing installation of speed sensors. The basket on two AA batteries (large fingers).